Our Winter 2017 Investor Letter provides commentary on 2017 and our thoughts and observations on the coming year. 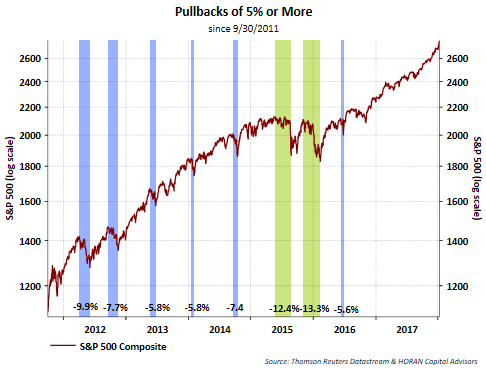 Many strategists and investors have either commented on or know from first hand experience, in 2017 the equity market saw very little downside market volatility. Our expectation for 2018 is the market will see a more normal level of volatility. As we comment on in our Investor Letter, that normal level of volatility would be a 14.1% decline from peak to trough. A decline of that percentage amount would equal 3,500 Dow points, and that would represent a normal pullback. For additional insight into our views for the market and economy in the coming year, see our Investor Letter accessible at the below link. Will The Stock Market Ever Decline Again? A Balancing Oil Market, But Will It Last?